The Parish Church of Well with Snape. St Michael's always was the Parish Church for both villages although Well was the smaller of the two villages and the Lord of the Manor lived in Snape. Its ancient link to Roman and possibly even earlier religious practices however meant that it was the public place of worship for both villages. In 1926 when the Snape estates were sold out of private ownership, the then private chapel in Snape Castle was adopted by the Church of England as a public place of Worship and became a Chapel of Ease to St Michael's. Hence the Parish of Well with Snape. Worship takes place in both churches and services are normally held on alternate Sundays - 1st and 3rd in Well, 2nd and 4th in Snape. There are of course exceptions to this pattern on high days and 5th Sundays. The 5 yearly inspection of the structure of St Michael’s in 2012 identified a number of serious problems with the nave roof and the tower roof. The costs for the work required were well beyond what could be funded by our reserves so funding assistance was sought from the Heritage Lottery Fund. We are now at the end of that work, no more leaks, no more pigeons in the belfry, the clock faces are clean and the hands on the clock face will not be falling off. Of the £110,000 required for the work, the HLF provided £75,000, the Wolfson Foundation £10,000, the LPW Grant Scheme £17,500 and St Michael’s found the rest. 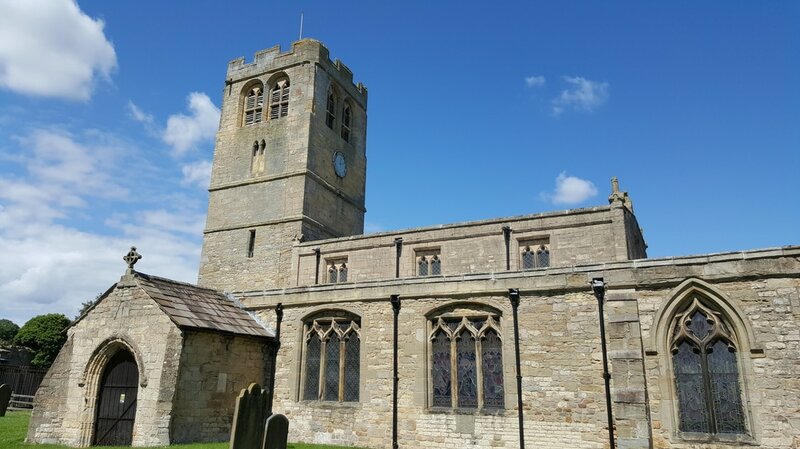 Without the support of the HLF and Wolfson Foundation the Church would be in crisis, the Project Team thank them for their financial support. Our thanks also to PPIY Architects of York and to Crighton Conservation of Brompton, the contractors, for the work on the roofs. Finally special thanks for the creative input and graphic design talents of the staff of the North Yorkshire County Records Office for guiding us in how best to portray the long history of St Michael’s with this timeline and the display boards. The Timeline in the Church is what you see below. Not only does it show the long history of the Church, the present parish church at Well is at least the third on the site; the first was probably the one recorded in the Domesday Book of 1086 ‘Welle – there is a church there and a priest’. This early church was superseded by a Norman building c1190 and the present church dedicated to St Michael the Archangel, was begun in the early 14th century. who have been involved with the church over the centuries. In the church there is also a guided tour around 20 interesting things in the church. A number of visitors to St Michael' s are researching their family history. Well is the graveyard for both of the villages and we have available as part of the Visitor Information a record of burials back to the early 19th C. Through the good offices of the Snape Local History Group we have access to a considerable amount of information about local families. The timeline above gives an overview of the history of St Michael's Church. You can scroll left and right by clicking and dragging on the image, and can zoom in and out using the + and - buttons. This is a copy of the timeline display which may be found at the west end of the church itself.